With $36.4 billion, Harvard has by far the largest university endowment in the world. While the endowment is vast, it is surprising to hear that the school has had a very disappointing 4.4% average annual return the past 10 years. 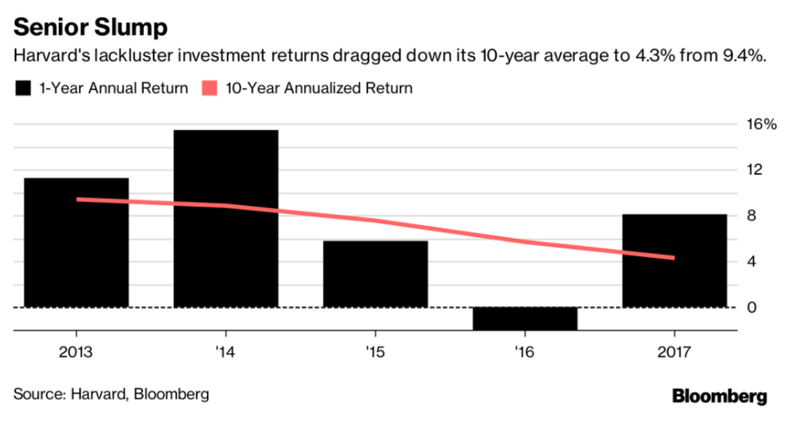 This would not even beat the 6.4% one would have earned in the same period by investing in a market-tracking index fund holding 60 percent stocks and 40 percent bonds. The biggest cause of this low return has been the endowment’s bet on real estate for natural resources internationally. According to the Bureau of Labor and Statistics, the natural resources industry consists of establishments primarily engaged in growing crops, raising animals, harvesting timber, and harvesting fish and other animals from a farm, ranch, or their natural habitats. The establishments in this sector are often described as farms, ranches, dairies, greenhouses, nurseries, orchards, or hatcheries. A farm may consist of a single tract of land or a number of separate tracts which may be held under different tenures. For example, one tract may be owned by the farm operator and another rented. Domestically, the USA has the second highest total estimated value of natural resources, estimated at $45 trillion. Harvard’s recent increase in allocation to its national resource investment began with domestic timber in the 1990s. The school was an early pioneer in timber investing and was once the largest institutional owner of timber in the world. The asset class was seen as stable, as well as a good way to hedge against inflation in a non-traditional way. Until the 1990’s, the majority of timber assets were held by large conglomerates that were not efficient in managing the land they owned. Harvard attempted to be more efficient in its management of timber, including creative use of the land such as selling off mineral rights and alternative energy generation. For 15 years, the Harvard endowment earned strong returns, as it had allocated at times up to 10% of its endowment in the domestic timber industry. This string of success changed after the 2008 recession saw the Harvard endowment suffer a huge drop in value. In its attempt to “diversify” its holdings after the recession, Harvard expanded its timber operations from domestic to international. From 2005 to 2013, the University went from holding about 15% of its $31 billion portfolio in emerging markets to 22%. Some of the investments the school made includes Central American teak forests, a cotton farm in Australia, a eucalyptus plantation in Uruguay, and timberland in Romania. The biggest mistake the school made was its foray into the remote and impoverished Northeast of Brazil. In Brazil, Harvard invested at least $150 million in a sprawling agricultural development that it hoped to cash in on as the designated resources became scarce around the world. The property consisted of thousands of acres around the remote town of Guadalupe, with plans to invest up to $1.5 billion as the project grew. Harvard planned on hiring workers to produce tomato paste, sugar, and ethanol, as well as energy from the remains of crops. By tapping into some of the world’s greatest Ph.D.s and other bright minds, Harvard expected to capitalize on cheaper overseas land and find opportunities that would create profits, in theory, that would dwarf traditional stocks and bonds. Unfortunately, the University realized its mistakes and recently wrote down the investment. This had to do with the economy in Brazil slowing, as well as government corruption and scandals growing worse. Cumulatively, Harvard wrote down its worldwide natural resources portfolio by $1.1 billion2 in 2017, to just $2.9 billion. What went wrong? In interim CEO Robert A. Ettl’s annual endowment report, he attributed the loss in part to the “unfavorable market and business conditions across two assets in South America.” While initially hoping to hold on to the assets for 10-year periods, weathering any storms that arose politically and financially, Harvard simply took too many blows to remain on that track. Recently, the University sold off timberland located in Uruguay worth about $120 million, including a eucalyptus forest with over 20,000 hectacres of tree farms. Other issues that arose were questions regarding how responsible Harvard has been with it’s forestry. While investing in natural resources domestically, Harvard weathered the ethics questions of their forestry practice by earning certifications and adhering to laws. In countries such as Argentina and Brazil, however, the need to have responsible management goes beyond simply having a clean image on paper. For example, in 2013 the Chilean government sued Harvard’s Agrícola Brinzal for illegally reforesting 189 acres of native forest with a foreign tree species eucalyptus. Around the same time, Romanian authorities arrested a contractor for another Harvard-owned company on charges of corruption and bribery, leading to a quickfire sale of its forestry. By going overseas, Harvard miscalculated much of their need to stay hand-on with the projects, leading to poor management of their assets and financial losses. As a whole, the international market is expected to see gains in the coming years, though coming trade tensions may slow this growth down. As a whole, it is yet to be seen whether Harvard’s disappointing foray into the international resources industry was a problem of incorrect timing, or an issue with the market as a whole.